Today's feature is a real pleasure for me, because I get to talk to someone who has been a great inspiration to me. 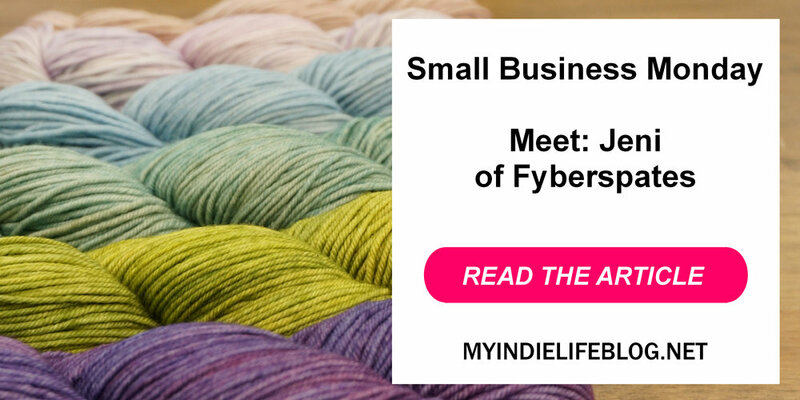 Someone who has taken their passion for textiles and turned it into a very impressive yarn business. If you are a knitter you have probably come across of one of Jeni's yarns at a yarn shop, or on-line. The Fyberspates yarn collection has a growing worldwide recognition... and all to think it started in Jeni's bedroom back in 2005! Want to hear more? Let Me Introduce To You Jeni Hewlett From Fyberspates. What inspired you to start Fyberspates and how did you make it happen? When did you realise you had to take the next step with your small dyer business? My favourite thing is research and development, so having to repeat anything is not in my nature after a certain point, this was a big issue for me when it came to scaling my business, repeatability was key if I wanted to grow and expand. I worked with my main supplier (now my husband!) on developing yarns for his undyed yarn business, and in return he financed commercial spin runs of yarn for Fyberspates, this meant I finally had products I could sell to shops and in my online store which allowed me to grow, the business then became big enough for me to be able to employ some help and also gave me an advantage because I had high stock levels which allowed me to do shows and to take part in larger projects. What was the most difficult part of taking your business to the next level and having your yarn manufactured for you? Getting products which were the same as I could produce at home in my studio (which was kind of impossible at the start), and then getting them out to a larger audience which were not the customers who had grown with me from the beginning. These core customers didn't need patterns, and had high skill levels, when you sell on a larger scale you are marketing to customers with huge differences in skill levels and expectations, ten years ago it Ravelry was only starting, and people wouldn't purchase yarn without patterns, this was like an uphill battle for me, I naively assumed that all knitters would be like my core customers, but they weren't, these issues were also barriers to shops for me too so it was a massive learning curve, but I wouldn't change the experience, it gave me a great grounding in business in general which has set me in good stead. How different is Fyberspates now from your original business idea? Weirdly it's on track for what my goals were, I didn't actually expect for Fyberspates to be the end goal, but more as a vehicle to doing all the things I love, and when Fyberspates became part of Chesterwool this seemed like a very natural fit, my skills from Fyberspates has given me exactly what I needed to be part of Chester Wool, and they fit perfectly side by side, Fyberspates is very creative, Chesterwool takes alot more research and I have had to seriously increase my business knowledge for this role, but my original dream was to have a company which was outside of the mainstream and push the boundaries through a genuine love and understanding of our products, and I think that's exactly what we do. Understand your margins, this is super hard at the beginning, but making the effort to try will only lead to success. This is the make and break of a business, turnover means zilch if you are making no profit. Profit means you can push the business forward and employ people. If you see people under pricing, ignore it, most of the time they will have not done their costings and will go out of business in the end, and trust me it happens all the time in our industry, so I ignore other peoples prices and do what works for me and never apologize for it, and it's worked so far. Thank you to Jeni for being so generous with her time and let’s wish her continued success with the business.